The stage manager is the renaissance man of the theater. 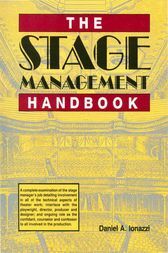 He or she must have a working knowledge of how the various technical aspects of the theater work (scenery, props, costumes, lights and sound), be part director, part playwright, part designer and part producer, and be prepared to act as confidant, counselor and confessor to everyone else in the company. This book addresses all of these considerations in detail and offers the readerprofessional or amateur, veteran or beginnerhelpful guidance and practical advice, supported by many forms and examples to illustrate the points covered in the text. The three phrases of mounting and performing a show are covered. Part I takes the reader through the pre-production phaseresearch, the script, planning and organization, and auditions. Part II covers the rehearsal processrehearsal rules, blocking, cues, prompting, information distribution, technical and dress rehearsals. Part III discusses the performance phasecalling the show, maintaining the director's work, working with understudies and replacements, and more. Part IV provides insights into the organizational structure or some theaters and aspects of human behavior in those organizations. Many stage managers of long-running commercial productions believe thatonce the show is up and runningonly ten percent of their work is related to everything covered in Parts I, II and III. The other ninety percent is associated with issues in Part IV; i.e. "managing" human behavior and maintaining working relationships.